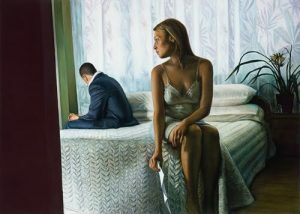 Anwen Keeling’s realist paintings seem to intentionally play on the intrinsic voyeurism humans possess, making viewers feel as though they have interrupted a very private moment. Like a filmstill, they offer an intimate glimpse into a fragmented narrative. Blurring the boundaries between public and private, Anwen’s artworks are evocative, sensual and ambiguous, with an underlying sensitivity towards all aspects of femininity. As the cliché puts it, a picture tells a thousand words, and Anwen wants such stories to be open for interpretation. “I guess being female, I relate to the female form,” Anwen explains in reference to the women she so realistically renders on her canvases. “I think there is much beauty in the softness and curves of the female form. This is something that has been celebrated throughout the history of art, albeit mostly by male painters in the past.” Here Anwen is talking about art critic John Berger’s theory of the gaze, and the way in which male painters have historically structured the female figure for the sexual gratification of an explicitly male audience. 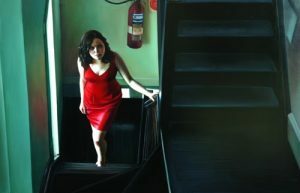 While Anwen’s work still has a certain and somewhat brooding sexuality to it, she paints from her own perspective, effectively subverting the dominant tradition of the female as an object and instead imbuing her wholly in the unfolding action. 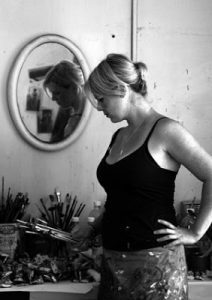 Considering the depth of detail in her artworks, it is no surprise that her artistic process is arduous. “I set up my models in a scenario and generally discuss a story about what has happened and try to get them to tap into some sort of emotion. Then I take plenty of photos and depending on the model’s patience, sometimes I do quick sketches. I then play around on Photoshop until I get an image that I am happy with.” And this is just the first step. “I then work out a scale and get my canvas made to order at the specific size from the best art shop in the world – Parkers in The Rocks.” Next, the artist will make sketches with willow charcoal, sometimes using griding if the painting involves a complex perspective, and follow this by working quickly and loosely with a very thin, wash-like paint to block in the image. “Sometimes I wish I had left the work at that point, when the loose underpainting is really strong, but then I get all tight and detailed on top.” At this stage, she explains that she works in layers of thin glaze over the whole picture “until I decide it’s done!” Depending on the scale, it can take over a month to complete a painting, with a minimum of a couple weeks per piece. When asked about her favoured materials to work with, she answers “oils, oils, oils! And Belgium linen – a fine smooth hand primed linen with a soft, slightly chalky feel – as well as beautiful quality paints and brushes.” While her repertoire ranges from female figures, dogs and high heels to domestic interiors and beyond, heads, hands and horses are always among her favourite things to paint. The most difficult, she tells us, is feet. Besides taking inspiration from old-school screen sirens, Anwen is currently going through what she describes as a “George Stubbs fetish,” referring to the English artist known best for his paintings of horses. “I really fancy myself as the next Georgette Stubbs!” she says. “All my friends are getting married and having babies so it’s harder to find models. 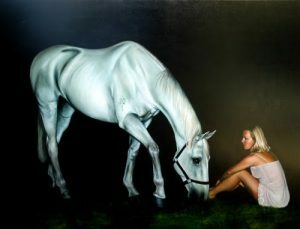 I’ve looked into another area of my life for inspiration – horses.” When she’s not working, Anwen spends her time riding her own horse and tells us that her next show will be an equestrian series, of which the first paintings are hanging as finalists in the Sulman Prize at the Art Gallery of New South Wales. So what is she working on at the moment? “A mighty fine steed,” she says with a smile.